Pretty much all of Hannah's outfits are, at a minimum, mildly entertaining. Her outfits this week were a little more. I didn't manage to get a picture every morning, but I did manage to capture three examples of Hannah's talent at combining colors and patterns. This is in part because she discovered her summer dresses hanging on the top rung of her closet. She's been pulling over the chair in her room and choosing a different one every day as a top layer. On the way home from school on Monday she told me that she was pretending to be a rainbow unicorn on the playground. 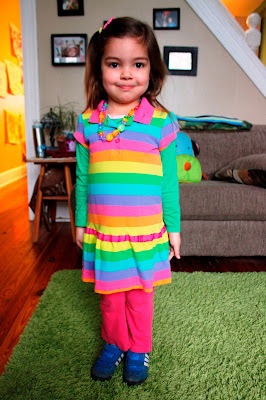 On Tuesday morning, she came downstairs wearing this little number. On Tuesday afternoon we visited the midwife and ran into the mom and 3-year-old daughter who had the appointment before us. 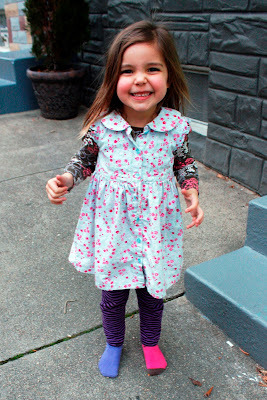 The little girl was wearing a dress that I recognized as one that Hannah has, and I said so. The next morning, Hannah pulled that dress from the top rung of her closet and put it on over her purple and black striped leggings and a brown shirt with pink, white, and purple flowers. I missed forgot to snap a pick on Thursday morning, and then when we went hiking around Cylburn after school, she peed all over the back over her pants attempting to squat in a bush, so that outfit was disassembled before we could get back home and take a picture. On Friday she returned to an old fashion choice of hers in which she wears socks on her hands. You can only see the socks on her feet in one of the above shots, but it's worth noting that she chose two different socks to wear every day of the week. It occurred to her that there were no rules saying that socks have to match, and she has delighted in not matching all week. I love seeing what crazy, colorful concoction she's going to come up with every morning and hope her outfits are always this creative! 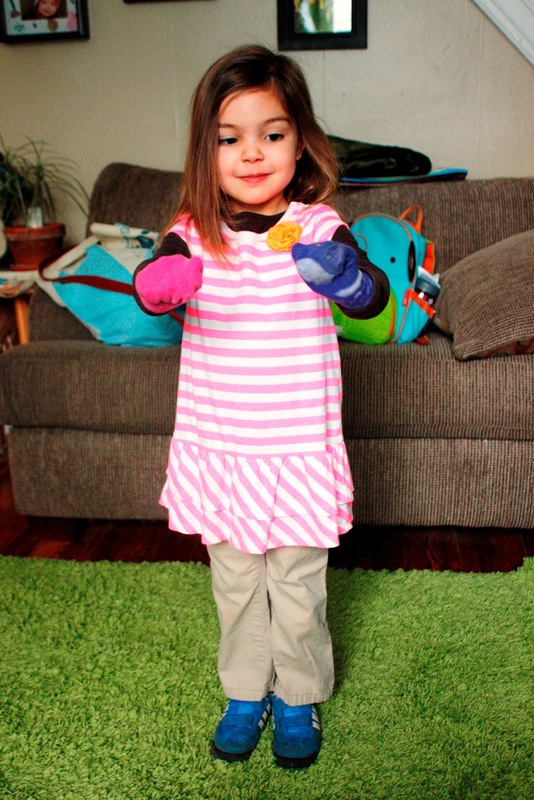 No following fashion trends for her -- she'll be creating them. Bowling with Brandy and a belly shot to boot!